I first met Sahil at IIT Kanpur in February of 2011. I was there, along with my co-founder, to pitch our B-Plan in front of a panel of judges as part of Ideas’11 competition. Sahil had convened a meet and-greet for all the participants, the night before. I could already see the passion with which he spoke about entrepreneurship, startups and the zeal to build something. It’s been a little more than 2 years, since; but the kind of progress that Sahil, his co-founders and bluegape.com has made is incredible. So, I decided to have him tell the story.. the story of ‘Pivoting’. We started bluegape.com out of our dorm room, at IIT Kanpur, in August 2011. Ayush and I had no clue as to what business meant. We started selling customized posters online because we wanted to have posters in our dorm room, but we could not find any site selling posters online. We were solving a problem but we had no idea about the market size of posters in India. People could upload products on our site and can get customized posters at their door steps. When we met our first investor, he told us that he was ready to give us a check of 10 lacs (INR 1 million); but he was sure that we would pivot very soon, for posters were definitely not going to be a billion dollar business. (A Million Dollars ain’t Cool. You Know What’s Cool? A Billion Dollars). So, we had to expand from selling posters to a billion dollar venture. We have been through a lot of thought process since, which I’m going to detail now. We are building a company where students can find products like Posters, Hookah and Poker Sets, Bean Bags etc. We were the company that sells cool products to college students. Vision : People can get what they love and show it to the world. Reason for Pivot : It was a complete inventory led business with a very high burn rate. Timeframe : Dropped the idea at idea stage after meeting few vendors for bean bags. We kept selling customized posters till March 2012. We are building India’s biggest customization platform where people can create products of what they love just like they were creating customized posters. The idea was to expand into customized t-shirts, mugs, cushion covers, laptop skins etc. Reason for Pivot : People in tier 2 cities still use Internet Explorer. It was tough to penetrate into a market with that technology. Timeframe : We executed customization from March 2012 to November 2012. People are creating products of what they love; be it Messi, Avril or Sachin. Why not grab their rights and give people ready to pick stuff which is exactly what Fan Merchandising is. So, now we are building India’s Biggest Fan Merchandising store. Vision : People can buy what they love and show it to the world. Reason for pivot : People want to buy products of their favorite brands but don’t want to customize. People love to own products of what they love or are a fan of. Fan Merchandising is a $60 billion industry in India. It’s a high margin business and no inventory model at bluegape. bluegape has a low operational cost so there’s in no urgent need to raise Big VC money to scale the business. There’s still no big player in the customization business. More brands + technology is a answer to scale the business. Atleast this will be a one those merger of E-Commerce Industry which is not driven by VC pressure but because of synergies. We pivoted but our vision statement remained constant for the whole period. We gave power to people to show off their attitude. It’s important for any business to stay consistent with the problem they are trying to solve. 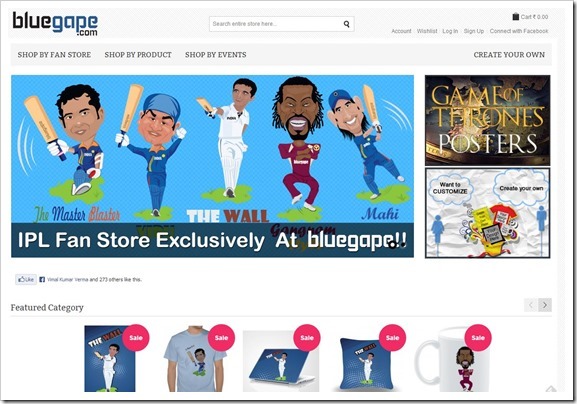 bluegape.com is a Fan Merchandising business started by three undergrads from dorm rooms of IIT Kanpur. The company is doing great i,e is profitable. They received the first round of seed funding of INR 10 Lakhs from Times Internet Ltd (They were incubated in TLabs). They received another round of funding of an undisclosed amount from backers including Aniket Khera, Rahul Bhatia and an unnamed Internet entrepreneur. Founders graduated in Aug’11 and are now running the complete show with a team size of 20+. bluegape has a strong team with a strong vision. The idea is to build a company where people can find Fan Merchandising of the brands they love. In the states, it’s pretty easy to find merchandise of Google, Zynga or Harry Porter but in India it’s not very easy to find Fan Merchandise of CCD, Games2Win or DDLJ. Bluegape is trying to fill that gap between brand and people who want to flaunt with brand’s Fan Merchandise.